“We have decided to abandon our North Atlantic record attempt.” It was with these words that Giovanni Soldini and his nine-strong crew announced yesterday evening from Maserati that the New York-Lizard Point Atlantic record was nowdefinitely beyond the realms of possibility. 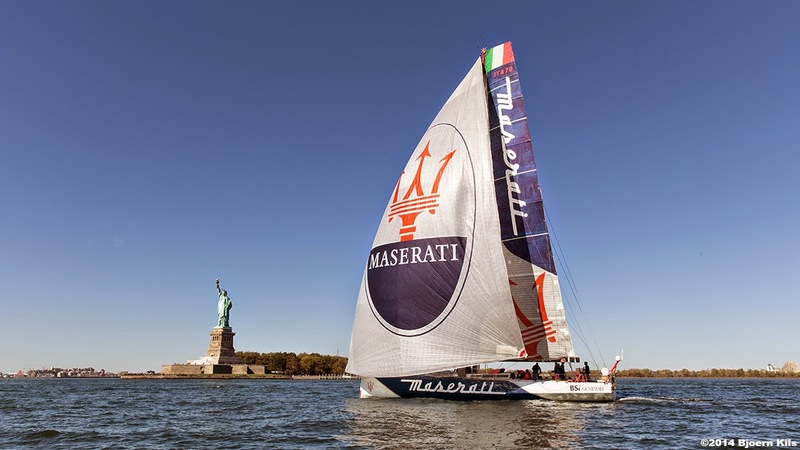 Maserati cast off from New York at 00:27:20 GMT on October 17th and would have had to do the 2,880-mile crossing between Ambrose Light and Lizard Point on the westernmost tip of England inunder 6 days, 17 hours, 52 minutes and 39 seconds to beat the record held by the 140’ maxi yacht Mari Cha IV. Soldini continued, summing up the salient points of the attempt as follows: “ When we cast off from New York we knew that this weather window would involve some risk and difficultpassages, the first of which we encountered after barely 12 hours: a passage with very little wind which cost us dearly. The second unknown factor was the real speed of this cold front. Forecasts suggested it would be behind us and slower, but it actually overtook us. The third critical point was the arrival which would probably have been in very little wind. All in all, it wasn’t the ideal window we’d all been dreaming of with stable winds and big easy-to-predict systems. However, it was also the best opportunity we’d had since June in a year that has been very unusual indeed from a meteorological point of view. Now though we have to think to the future and to prepare fornext year we have to do two months of serious maintenance work in Italy. That is why we are sailing first to the Azores where we will stock up on provisions and diesel, and then we’ll make for Gibaltar and La Spezia. After almost two years and 70,000 miles around the world, we are returning to the Golfo dei Poeti, the best place for us to look after Maserati”. The challenge is sponsored by ourmain partner, Maserati, after which the yacht is named, and by co-sponsors Swiss bank BSI (Generali Group) and Generali itself.